Joanna Jedrzejczyk is making sure she’s on weight and feeling great ahead of UFC 223. Following a disastrous weight cut ahead of the first loss of her career last November, the former women’s strawweight champion has enlisted the services of noted nutritionist George Lockhart ahead of her rematch with Rose Namajunas as next weekend’s card in New York. Jedrzejczyk has always been one of the bigger fighters competing at 115 pounds, but she always found a way to beat the scale before stepping into the Octagon the next night. Unfortunately the weight cut backfired on Jedrzejczyk ahead of her last fight and the result was the first loss of her career as well as dropping her UFC strawweight title. Now Jedrzejczyk is working with Lockhart’s company, Lockhart and Leith, ahead of her next fight with Namajunas on April 7. Lockhart and Leith has worked with numerous UFC fighters over the years including Conor McGregor, Daniel Cormier and Max Holloway. 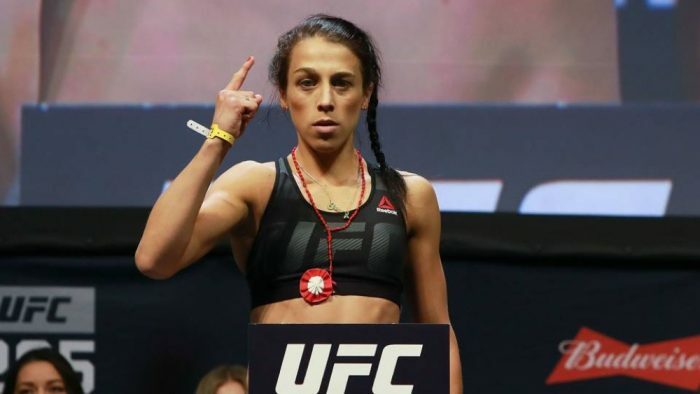 Now they will add Jedrzejczyk to their roster of fighters as she looks to make a healthy cut down to 115 pounds before competing for the strawweight title next weekend.